Nanoscientists discovering a new reaction mechanism to cleave cellulose efficiently and environmentally friendly. 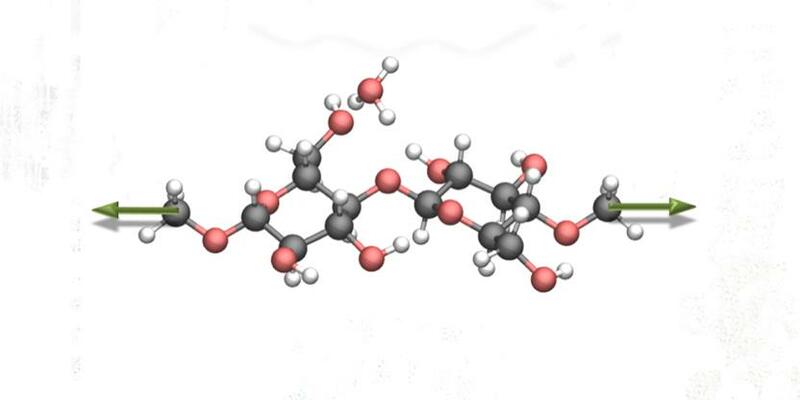 The molecular structure of cellulose, to which nanoscientists applied mechanical force (green arrows). The hydrolysis reaction changed dramatically as a result. 15-Mar-2019: One of the greatest global challenges is the efficient use of renewable sources in order to meet the increasing demand for energy and feedstock chemicals in the future. In this context, biomass is a promising alternative to existing fossil sources such as coal or oil. Cellulose plays a decisive role here because it accounts for the largest fraction of the natural carbon storage. These reservoirs are crucial for the production of both fuels and basic chemicals. In order to utilize its full potential, the chain-like structure of cellulose must be broken up. This can be done by a so-called hydrolysis reaction, which, however, is difficult due to the atomic structure of cellulose and has been very costly so far. S. Amirjalayer, H. Fuchs, D. Marx: "Understanding the Mechanocatalytic Conversion of Biomass: A Low‐Energy One‐Step Reaction Mechanism by Applying Mechanical Force. "; Angewandte Chemie Int. Ed. (2019).